The extra-cellular RNA processing toolkit (exceRpt) was designed to handle the variable contamination and often poor quality data obtained from low input smallRNA-seq samples such as those obtained from extra-cellular preparations. However the tool is perfectly capable of processing data from more standard cellular preparations and, with minor modifications to the command-line call, is also capable of processing WGS/exome and long RNA-seq data. 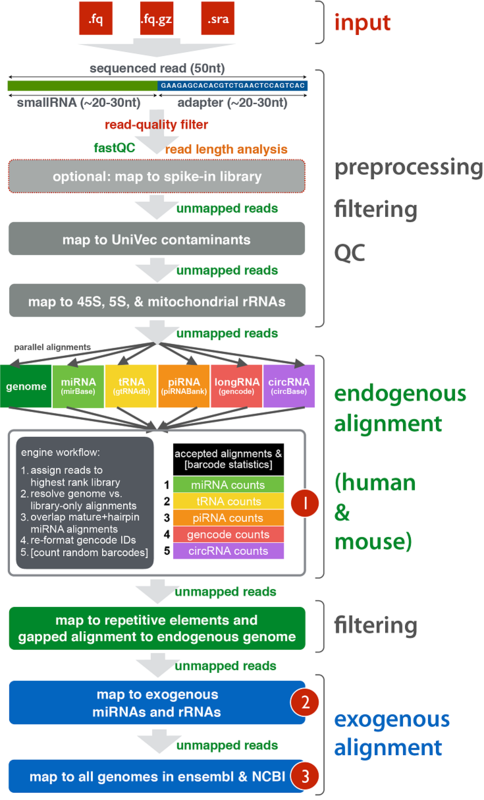 The schematic diagram below details the various stages of the exceRpt pipeline including pre-processing of the raw reads, contaminant removal, alignment to the endogenous (human/mouse) genome and annotated transcriptome, and finally alignment to a large number of exogenous sequences for detection of foreign nucleic acids. Signing up for an account on Genboree.org is by far the fastest way to start using exceRpt. The Genboree Workbench provides a graphical interface to exceRpt that is free for academic use. Set up a free account to use the Genboree Workbench, upload some data, and start using exceRpt, all via the browser (instructions available here). Slightly more effort to get set up than using Genboree, but using the Docker image is the best way to use exceRpt on your own machine/cluster. The exceRpt Docker image is pre-baked with all required dependencies and should ‘just work’ with minimal installation. Docker is native on Red Hat Enterprise Linux distributions (RHEL) and also available on Amazon, enabling exceRpt to be run in the cloud. Instructions are available for installing Docker on Mac OS X, Linux, Windows, and Amazon Web Services. BEWARE, exceRpt requires about 16GB of RAM in order to function properly, runs on machines with less than this amount of available memory will very likely fail. If running Docker inside a virtual machine (such as via VirtualBox on Mac OS X) it is important to check that the VM has been initialised with at least 16GB of memory. This is usually a setting that can be modified as long as the VM is not currently running. RNA-seq read pre-processing can be achieved using much less memory, however much of the useful output of the tool (e.g. all alignments / transcript quantifications) will be unavailable. Machines with sufficient memory will almost certainly be equipped with a sufficient CPU, however machines with fewer than 4 CPU cores may struggle to run the alignments required by exceRpt. There are two other optional exceRpt databases for completing the analysis of endogenous-unmapped reads by mapping to all known exogenous miRNAs, rRNAs, and genomes. The miRNA sequences are obtained from miRBase, ribosomal-RNA sequences from the Ribosome Database Project, and the full-genomes of all sequenced bacteria, viruses, funghi, plants, protists, and ‘edible’ eukaryotes obtained from Ensembl and the NCBI. These two exogenous databases are available at the locations below (beware the very large size of the exogenous genomes database, which is around 1.5 TB and will take a long time to download). When running the Docker image, including these exogenous databases requires a slight modification to the standard ‘docker run’ command - please contact the exceRpt authors for further information. Once you have downloaded the desired genome database and have successfully installed and started Docker on your machine/cluster/AWS-instance only a few commands are required to install and run exceRpt. Most of the Docker command is loading directories on your machine (the -v parameters) so that exceRpt can read from or write to them. The directory to the left of each : can obviously be whatever you want, but it is important to make sure the right side of each : is written as above or exceRpt will not be able to find/write the data it needs. There are a number of options available for customising the analysis that are specified using the command-line. These are a list of the most commonly-modified options and their default values. RANDOM_BARCODE_LENGTH            | <int>                 | [default: 0] identify and remove random barcodes of this number of nucleotides. For a Bioo prep with a 4N random barcode on both the 3' and 5' adapter, this value should be '4'. This is the most labour-intensive mode of using exceRpt, but it offers the most flexibility. Generally not recommended unless you are very familiar with the *NIX environment, shell scripting, and makefile syntax. Detailed instructions on how to install exceRpt and its various dependencies will [one day] be listed toward the bottom of this page. It is important to properly configure the makefile for this to work. It is probably a good idea to get in touch with the maintainers using the email address listed at the bottom of the page before embarking on this yourself! Alignment summary information obtained after invoking the library priority. In the default setting, this will choose a miRBase alignment over any other alignment, for example if it is aligned to both a miRNA in miRBase and a miRNA in Gencode, the miRBase alignment is kept and all others discarded. It is especially important for tRNAs to be chosen in favour of piRNAs, as the latter have quite a large number of mis-annotations to the former. Where ReferenceID is the ID of this annotated RNA, uniqueReadCount is the number of unique insert sequences attributed to this annotated RNA, totalReadCount is the total number of reads attributable to this annotated RNA, multimapAdjustedReadCount is the count after adjusting for multi-mapped reads, and multimapAdjustedBarcodeCount (available only for samples prepped with randomly barcoded 5’ and/or 3’ adapters such as Bioo) is the number of unique N-mer barcodes adjusted for multimapping ambiguity in the insert sequence. Also provided is a script to combine output from multiple samples run through the exceRpt pipeline. The script (mergePipelineRuns.R) will take as input a directory containing 1 or more subdirectories or zipfiles containing output from the makefile above. In this way, results from 1 or more smallRNA-seq samples can be combined, several QC plots are generated, and the read-counts are normalised ready for downstream analysis by clustering and/or differential expression. This script is comparatively much simpler to install. Once the R software (http://cran.r-project.org/) is set up on your system the script should automatically identify and install all required dependencies. Again, this script is available on the Genboree Workbench (www.genboree.org) and is also free for academic use. Here, the directory in which the script will search for valid exceRpt output (~/DirectoryContainingMyexceRptRuns) should be the same as the (~/DirectoryInWhichToPutMyResults) specific when running each sample through exceRpt. exceRpt is maintained by gersteinlab. This page was generated by GitHub Pages.